New updated shape for 2011! This torsionally stiff carving design made of maple/fibreglass provides optimal energy return and good edge grip in a responsive and lively package. The dropthrough mounting works with most reverse kingpin geometry trucks and gives you more stable and comfortable pushing/foot braking plus a lowered centre of gravity. Shape: High Concave. Medium camber. Dropthrough. 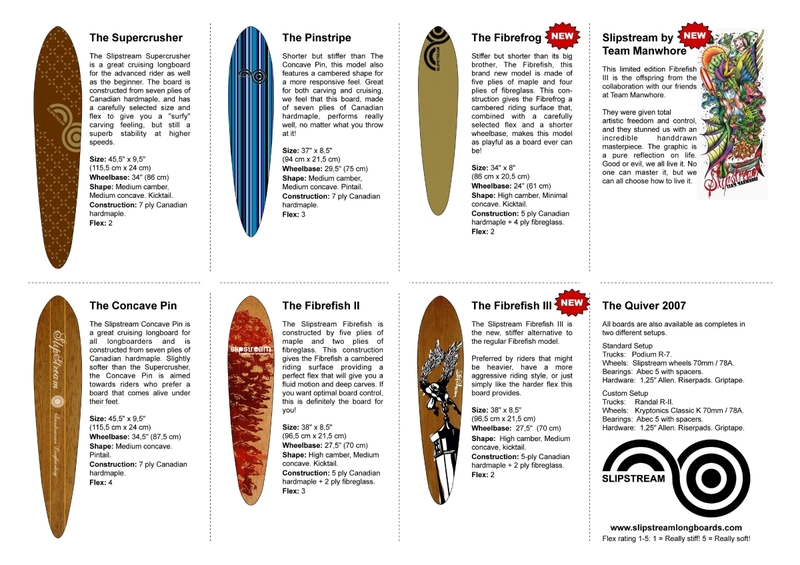 For freeride and speed carving it could be a good choice for you, but as a cruiser or cityboard you might want to check out a smaller board (Buddy, Pinstripe, Platypus, etc.). If possible, try one before purchase! I will have it to transport to and from school about 3km will it be good ? It will be good Oliver, Good Luck! I’m 193cm tall and weigh about 80kg. I am planning to use this board for cruising and some carving around town/some hills. Is this board a good choice? Peder: The Twin sounds like a good fit for that. But as always. The more boards you can try, the better. Vanessa: The Twin is good for any weight. Depending on how much you want your board to flex (if you weigh a lot it will be softer, if you are light it will be firmer). The Twin will not crack next to the trucks. Is this board any good for freestyling? Will i be able to do flips and drops with this board? Rasmus: The Twin doesn’t have any tail or nose. And it might be a bit on the heavy side for tricks. Good for stand up slides though! Maybe you should look at the Platypus? Hej, jag har Slipstream the twin 2010 och den är 104,5 cm eller 105 cm tror jag. Är the twin 2011 99 cm lång? På hollywoods hemsida står det 104,5 cm. Är intresserad av att köpa brädan, så vill veta lite om den nya modellen. Tänkte lära mig åka i sommar… undra om detta är en bra bräda att lära sig på kommer mest att bara glida runt på planmark lätta backar till att börja med, för att förhoppningsvis ta mig an lite svårare utmaningar längre fram och skulle helst inte vilja byta bräda då… kommer inte försöka lära mig trix eller downhill utan som sagt glida runt… frågan är alltså funkar den här att “glida” på både i början och när man blivit lite bättre ? Given its wide body and low profile, this board is a solid choice for beginners. A lot of experienced riders also prefer this model, but there is no guarantee that this will be the case for you since all riders are different and develop different preferences. Try it before you buy it if possible! I`m 150 cm tall and wheigt 42 kg is this a good board for me? If you like boards that are big this will probably work, as well as this could be a board that you could “grow into”. If possible, try one and find out for yourself before you buy it! why ain’t this board working with R7 trucks? It does not work “out of the box”, but if you shave off like 0.5 mm on the inside of the hole facing the centre of the board it will work. The same goes for some Gullwing trucks. Sorry about this! Var görs dom här brädorna? Our boards are made at a subcontractors facilities in Taiwan. heey i 11 years old 150cm tall and weight 36-40 will this flex alot for me? No, this board will not flex a lot for you. i cant see the price how much do it costs? Please contact your local dealer for current pricing! Hi, my weight 93kg, can I use this board? How can I buy from Spain? You can use this board, no problem. We have no Spanish dealers at the moment, but please feel free to contact a dealer from another country and hopefully they will be able to help you out! I was wondering if I should buy the lowrider or the twin. I’ve been checking both out, but I can’t see to make my mind up. I’m looking for a board that I can use as transport (to school) and as well ride down hills and doing slides. Does both work the same for cruising? Tough question, we lean slightly towards The Twin in your case, but The Lowrider will work as well. You should definitely try both if you get the chance! Hi there, im about 186 and my weight is 58-61 can i use this board? i would like to do some tricks and some downhill also speed and be able to slide or is there another better board for what i am searching for?. How much does this board cost? Your height and weight will not be an issue using this board. It will be a decent compromise doing the things you want to do, but please try different boards if possible and see for yourself what you prefer! Please contact your local dealer for current pricing. There is no such thing as a perfect “do it all” trick/downhill/slide board and many riders have different boards and setups depending on what they want to do. For Downhill/Freeride/Speed we could recommend “The DFA” and for technical tricks we could recommend “The Platypus”, but as always YOU decide what you like. If possible, try different boards and make up your own mind. My Slipstream Twin 2010 just got run over by the bus. The board is in one piece but the trucks shattered the “twins”. Anyway, i have to buy a new one. I was very pleased with the Twin but im thinking of trying a new board. Im thinking of the Twin, Wedgie and the Lowrider. Is there a big difference between them if you go downhill? I don’t do lot of downhill. Sorry to hear about your board. The Twin is probably the most stable board of the ones you mention going downhill. A bought a standard twin board and has been very happy. Now its time for an upgrade. Will i be able to topmount basic Paris and Randal trucks (180mm) on my twin board? Hi Andersen, glad you like the board! Paris as well as Randal 180:s work both top and dropthrough mounted on this board. i’m now riding a comet voodoo doll for DH/freeride, but i wanna try a dropthrough. i really like the shape of the twin. but i have heard some roomers about cracking and getting “sloppy”. i guess my question is: will the twin hold up with alot of sliding and speed carving or is it best when your just learning to slide etc ? If you hit a hard object (curb, pavement, wall, etc.) it is possible to get smaller cracks and even partial lamination if you are unfortunate. The board will still be fully operational, but aesthetically it does not look so good. Some riders are successful trying to minimize the risk of this happening by fixating various materials (plastic, glue, etc.) on the nose and tail though. We have ridden this one pretty hard now and it does not get “sloppy” like softer 100% wood boards normally do after hard riding, but you can naturally feel the difference between a new one and a heavily used one since all materials get “tired” after being broken in. but there is one thing. have you made it smaller? Size: 39″ x 10″ (99cm x 25,2cm) type’o? cause alot of local dealers still claim it to bee 41″ 104 cm. and if you made it smaller by the gods why? Yes we made it a little shorter for this season (39″ x 10″) for increased torsional stiffness and lighter weight. The body of the board is still the same, but the wheelbase is a little bit tighter! I have just purchased this board and i have too heard this roomers about theese kinds of boards cracking, and therefore want to buy a noseguard of some kind ;D I don’t live nearby any skateshops, so I wount be able to test what fits.. So do you guys know what noseguards that will fit ? Yes it is very common among dropthrough mounts, this construction is always weaker and less resistant to hard impacts compared to topmounts. There are numerous threads on Silverfish about noseguards and you can find a lot of DIY noseguard tutorials on Youtube – Take a look at those for starters! hej jag funderar på att köpa the twin eller madrids longboard letters 36.jag är hyfsat ny på longboard men jag vill ha en som jag kan transportera mig till skolan, vänner och bara åka för skoj skull. det är fyra km till skolan. jag är 175 cm och väger 62 kg. For commuting to school you might also want to look into “The Twin” or “The Wedgie”, but (as always!) try it before you buy it. 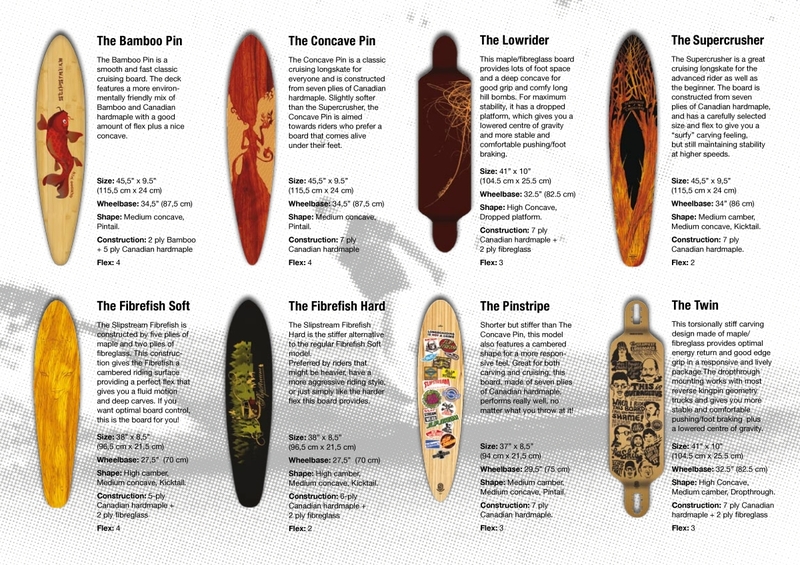 Hello, i’m thinking ablut buying a new board, right now i’m considering buying either “The Twin” or “The Lowrider” beacuse of their shape and what people i know think of them. Whitch board would you recommend? 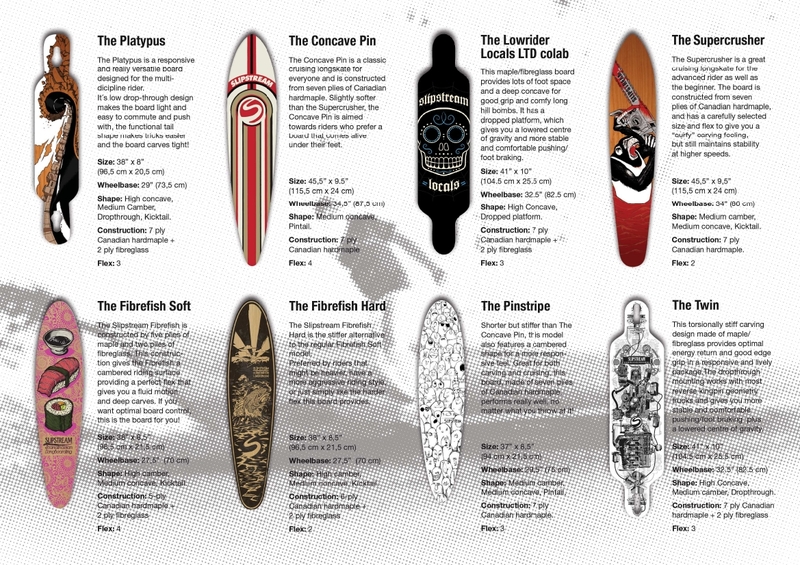 I like going fast but i still want to be able to cruise pretty smooth, So yeah basically I want an alround longboard! And i’m thinking about changing the grip tape to transparent and paint something under it? would it be a problem with the board if i do it as fast as i get it? We would probably recommend “The Twin”, but you should try both if possible and decide for yourself which one you like the most. Changing the griptape and painting the board is not a problem (but hard work!). You should know that transparent griptape normally is not as durable as the regular one. Thanx man, I really appreciate your quick awnser! Jag skulle säga the Twin eller the Platypus för att sladda. Men det bästa är om du kan testa alla tre och känna vad du gillar. Klarar brädan av 100+ eller kommer den flexa för mycket? Om det inte är för mycket över 100 funkar det. Men såklart blir den mjukare än om man väger mindre. Det bästa är om du kan testa och se ifall det funkar för dig. Hey i found this board on another website and it’s from summer 2011, is that this version of it? I’m 180 cm and weight 62 kg, i’m gonna use it for downhill, carving and slide, can i use the board for this? Hey William, yes, this is the 2011 version of The Twin. Will work great for your sliding and carving, but for serious, high-speed downhill you should look closer at the DFA and Jackal boards.